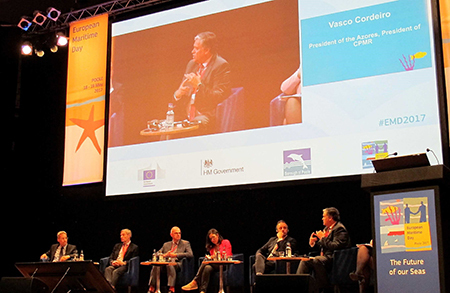 Vasco Cordeiro, President of the Autonomous Government of the Azores and the CPMR, took part in the European Maritime Days, held in Poole (UK) from 17-19 May. President Cordeiro joined Mrs Julie Girling, Member of the European Parliament, Mr Bernard Friess, Director of ‘Maritime Policy and Blue Economy’ for the European Commission’s DG Mare, and other speakers, for a roundtable discussion on sustainable development and the oceans. During the debates, President Cordeiro highlighted the importance of cooperation with maritime stakeholders to achieve the objectives of sustainable development within the maritime economy. In particular, he highlighted the example of the cooperation established in the Azores with the fisheries sector, which has produced convincing results on the management of fishing effort. President Cordeiro also underlined the need for the EU to give regions the support to invest in sustainable technologies linked to the maritime economy. From this perspective, he insisted on the importance of cooperation with the regions to define how the Cohesion policy and the European Fund for Strategic Investments (EFSI – Juncker Plan) can be complementary.